Where were you? This is terrific. This was at my son’s wedding. It’s my dad, husband, sons and the bride. 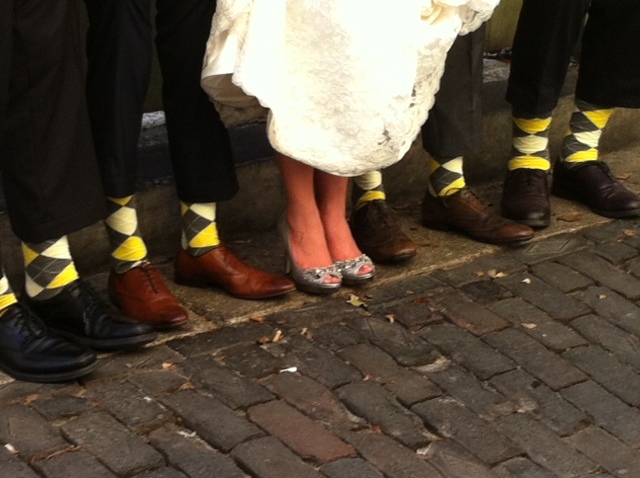 The groomsmen had the same socks, too. St. Augustine, Fla. I love it…whose idea were the socks? My son’s idea. I loved her shoes, too! Ahhh, that is SO cute. I love the matching socks…and that they aren’t subtle ones. What a fun wedding! Thanks Laurie. It was fun and my son’s not subtle when it comes to his argyle. Lol.